Pete Souza, Chief Official White House Photographer and Director of the White House Photography Office, has access unlike any other. Camera in tow, Souza travels alongside President Obama to visually document each meeting, trip and encounter for historical record. Check out his work on the White House Flickr photo stream and the photo galleries on WhiteHouse.gov. 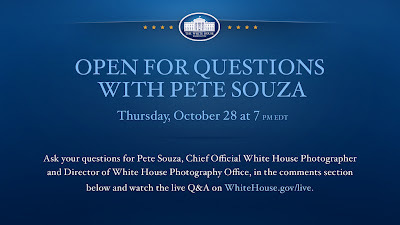 Don't miss the live Open for Questions event with Pete Souza on Thursday, October 28th at 7:00 p.m. EDT. He’ll be answering your questions about White House photography, his position, specific photos – and whatever else you come up with in a live video chat. i would really like to know how he got the job in the first place. He was voted in by the White House Press Photographers Association. Souza received the offer for the position from Robert Gibbs, the president's longtime spokesman who is also Obama's incoming White House press secretary. It is not Souza's first time in the Oval Office. He was also a White House photographer during President Ronald Reagan's second term. Obama and Souza met for the first time in January 2005, on Obama's first day in the U.S. Senate when he was sworn in as a Democrat from Illinois. Souza worked for the Chicago Tribune at the time, and documented Obama's first year in the Senate, and his trips to seven countries including Kenya, South Africa, and Russia, in photographs that were later compiled into the July 2008 book "The Rise of Barack Obama," which made it onto The New York Times bestseller list. I didn't find out about the live chat in time, so I didn't watch it, but i had the same question. Thank you Paul and Pete, your info is much appreciated.